SNJ Gets The Water Away! Over the years, SNJ Seamless Rain Gutter's dedication to keeping our customers happy with our work has never wavered. For residential or commercial, professional seamless gutter installation at a fair price, contact SNJ Seamless Rain Gutters to schedule your service today! We can be reached at 1-802-751-6191 or 1-800-980-4765 Monday through Friday from 7:am To 7:pm. Weekends are available by appointment. Contact us today, we look forward to hearing from you! We had a short window of time to get this done and they came on time to meet our schedule. They were on time. Hard working, didn't waste any time, very efficient. They did a great job. Very satisfied. The whole experience was wonderful! Very professional job and the workers were very personable and did the job quickly. Excellent service. Showed up on time. Work was completed timely and efficiently. SNJ Gutters did a great job on time and budget, hire them you won't be sorry.Work was done very quick and everything was spotless when they were done,and they worked so great,thanks guys. Drew and Dave were the installers and were very professional. Had to make a couple of last minute changes and they were invaluable with their advice. All in all professional outfit, reasonable prices and excellent craftmanship. We had planned to replace the gutters ourselves from one of the big box stores. Off we went with formulated list to a big box and immediately got confused and frustrated. Just the materials were expensive and then our time and effort, and lack of knwoledge were too much. 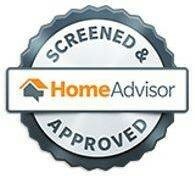 Used home advisor contacted two contractors SNJ only one that replied and totally glad we went with them. Thanks guys! 2man crew arrived on time, went right to work and were finished in about 2 1/2 hours, nice job. Thanks guys! This was the last of 3 other companies that I interviewed. The price was the best and they were very accommodating to my personal time frame for the project! I called on Fiday and they come on Monday. The instalation were done in 3 hrs and the boss called me personally on Sun to make sure I did not have any questions of last minute changes! I will use SNJ again and recommend them to all my friends! I am very happy with my seamless gutters and covers the snow and ice slid over the top they look great and I do not have to clean them. Great service and price as well.